Competition is always good because it gives us more choices. As we have witnessed in the brokerage industry, competition has forced more and more brokerage firms to offer commission free exchange-traded funds (ETFs) to their customers since late 2009 when Charles Schwab became the first broker to let its customers trade ETFs without commission fees. Schwab’s move was soon followed by similar offerings from Vanguard, Fidelity, TD Ameritrade, all allowing investors to buy and sell ETFs, either their own funds or funds from third parties, for free. 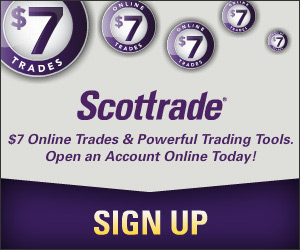 Last month, Scottrade joined the competition by launching its own ETFs. All the 15 FocusShares ETFs Scottrade offered not only are commission free for Scottrade customers, but also have the lowest expense ratios (ER) among funds that belong to the same asset classes. Commission free trading plus low ER could mean big saving over time because the combination of the two will lead to lower overall cost of owning these exchange-traded funds. Now, investors who are looking to build a diversified all-ETF portfolio have one more options to trade ETFs for free. Firstrade, a popular online discount broker, announced today that Firstrade customers can now buy and sell 10 most popular ETFs with no cost. Unlike Scottrade which issued its own ETFs and made them free to Scottrade customers, Firstrade took the similar approach as TD Ameritrade did, that is, the Firstrade commission-free ETFs are not its own, but from Vanguard, iShares and PowerShares. The full list of Firstrade commission-free ETFs and their ERs is in the following. When I wrote about Scottrade’s new ETF offerings, I mentioned that since those ETFs are very new, their trading volumes are likely to remain low for some time, which could lead to a higher overall cost due to the wider bid/ask spread. This, however, will not be the case for ETFs offered by Firstrade since the above funds are all well established. In fact, VWO and FXI are even among top 20 most heavily traded funds based on Morningstar data. Also, as you can see from the above list, these ETFs are nicely diversified with exposure in stocks (domestic and international), bonds (domestic and international), and commodity. Using the asset allocation plan that I discussed before when creating my own all ETF portfolio, I can almost build the portfolio with these commission-free ETFs from Firstrade, except there is no REIT and Gold fund. However, since DBC has exposure to both gold and silver, including DBC in the portfolio would still work. If you are not familiar with Firstrade, you can find out more about the broker in my updated Firstrade review post. Basically, you will pay $6.95 when buying or selling stocks plus another $1.25/contract for options trading. Firstrade’s stocks and options trading commissions are almost identical to Scottrade’s, but the cost for mutual fund trading is much lower at Firstrade ($9.95) than at Scottrade ($17). See my stocks and options broker compare page for detailed comparison of Firstrade against other brokers. BTW, Firstrade requires that the commission-free trades on the 10 eligible ETFs must be placed online, not with broker’s assistance. Though buying any of these ETFs is commission free, if you sell an eligible ETF within 30 days of purchase, you will be charged with the regular $6.95 online commission fee. Do you think this is the right time to invest in Gold or Silver ETF’s considering they are trading at their all time highs or are they expected to come down. Please Advice. I like your site. I post my own broker reviews on my own site and I did not have a favorable opinion of Firstrade until recently. In the last few months though they have redesigned their website, launched a respectable iPhone App and now with commission free ETFs they have a lot to offer. With that being said, the commission free ETFs offered at Fidelity, Vanguard and TD Ameritrade are far better than what Firstrade offers.